Sister Malia Felisita had eyes that sparkled when she teased, or that flashed with determination. Having arthritis in her feet from a young age did little to stop this woman whose missionary journey would take her many places. Born on the island of Nukunonu, Tokelau, on 6 August 1943, Kelematina Falaniko was an early scholarship student sent to Samoa in the early 1960’s. She and two others were accepted at St Mary’s College, Vaimoso, boarding there at the time. Kelematina came to New Zealand to join the Missionary Sisters of the Society of Mary, and made profession as Sister Malia Felisita 8 December 1965 in Heretaunga. She was assigned in NZ communities for the next two years: firstly at St Brendan’s, Heretaunga, then at St Anne’s Hostel in Auckland. In 1968 she returned to Samoa to Leulumoega, later moving to Vaimoso where she was a student for two years. She made perpetual profession in December 1971. Over the years Felisita visited her family and local church community in Tokelau. Visits from this, one of the first Tokelauan religious, were always a source of joy. In 2000 she joined a group going to Futuna where she was able not only to pray where St Peter Chanel and later our first sisters lived, but also to meet with her father’s family in Sigave. 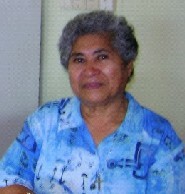 For twenty years SM Felisita taught in Samoa: in St Mary’s Savalalo, in the government school in Falealupo (2 years: 1980-81), and at the Catholic elementary schools in Leone and Lepua (American Samoa). Her training at Corpus Christi Training College in Suva and in the Montessori method further sharpened her teaching skills with infants. SM Felisita had the reputation of being strict, and sometimes children – even parents – were afraid of her. But at the same time, children would run after her. They knew her heart, even if she was scolding them. She was there for the little ones. She was also there for her sisters. Those smsm who lived with her were infuriated by her, admired her, were inspired by her, and loved her as our sister. In 1988 SM Felisita was one of the pioneering smsm in Kiribati working there until 1995. She felt that the path to the future was to begin kindergartens in order to get the children to look forward to and enjoy education. She began with a very successful pilot project that brought about unity between the Catholic community and the Kiribati Protestant Church members on Buota. She researched programmes for training kindergarten teachers through the University of the South Pacific. In many ways, Felisita was one of the primary movers of the pre-school programmes that are now everywhere on Tarawa and even in the outer areas. But work with little ones was not her only focus. Bishop Paul Mea wanted to introduce the Focolare Movement to Kiribati and in particular involve the youth. Felisita was asked to take up this challenge and during 1989 and 1990 had two trips to Australia to become familiar with the teaching and ethos of the Focolare. With fledgling leaders she spent many evenings in maneabas, at times staying overnight with the youth. In 1991 she was appointed the national director of the youth movement. As well as training Focolare leaders her task included obtaining funds for a permanent base for the youth. Felisita spear-headed a funding drive, and began projects for raising chickens and pigs as well as some vegetable gardens. For us smsm this brings to mind a similar income-generating project for pioneers proposed by a bishop of an earlier age. After almost eight years in Kiribati, SM Felisita returned to Samoa as community superior at Savalalo, and worked with the Alcoholic Awareness and Family Recovery programme. From 2000 she taught in Leone and Savalalo. She was the co-ordinator of the remedial programme for St Mary’s School, Savalalo, (900+ pupils) right up to the time she left for New Zealand. S.M.Felisita had the quality found in many who are pioneers: courage. She was the only Tokelauan to become an smsm. Whether in Samoa, Kiribati or New Zealand, she was always true to herself. She lived to the full the gift of herself to God for mission, even to the extent of leaving her own people and beloved islands. Her sense of humour and the ability to laugh at herself helped her through many tough times. She was truly “joyfully given to God for the kingdom in the spirit of Mary” (Const. 23). Her constant message to family and others was: Be strong. God was her source of strength. Like Mary, she wished to serve God forever, “strong in his love”. We also witnessed her great courage when faced with her final illness. Felisita arrived in New Zealand from Samoa with severe back pain on Saturday 27 June 2009. As a result of a visit to the doctor and tests, she was admitted to Middlemore Hospital on Tuesday 30 where she was diagnosed with multiple myeloma, and chemotherapy was begun. However she had several cancers and the aim was to keep her comfortable. She was transferred July 30 to the hospital section of Selwyn Heights Retirement Village. On the feast of the Transfiguration (6 August) in the company of several nieces and nephews and a number of smsm she celebrated her 66th birthday. It was a time to remember and give thanks, with Felisita leading the storytelling, making the effort to enunciate words clearly through her parched lips. The next day she became weaker, and God called her to eternal life on Saturday 8 August. S.M.Felisita gave specific instructions for her funeral: she wanted a celebration that was simple, joyful, Marist… A celebration of her life, full of gratitude for all the love and blessings that have been hers. God gave her to us. We give her back to God.